Flex Coat of Cement Based Protective Coating - MUHU (China) Co., Ltd.
Used as a waterproof coating for water tanks and reservoirs. Used as a flexible coating to bridge shrinkage cracks. Suitable to protect other cementitious substrates and masonry for new and existing structures. Used for reprofiling concrete and masonry surfaces. Waterproof suitable for water retaining structures. Impervious lining for water retaining structures. Protection of concrete from seawater ingress. Coating to prevent chloride ion ingress & carbonation attack. Excellent adhesion. Bonds to porous and non-porous surfaces. MUHU provides a comprehensive technical support service to specifiers, end users and contractors and is able to offer on-site technical assistance. Surface Preparation: Ensure that surfaces to be treated are free of dust, dirt, grease, oil and other foreign matter. Cut back spalled concrete until sound and make good with suitable repair mortars. If repairs have been carried out cure with water or suitable curing agents. On old concrete, remove all traces of conventional curing compounds and surface sealers prior to application. Mixing: JS Waterproofing Coating is supplied as Part A and Part B. Using a clean container, slowly add the powder to the liquid component and mix with a slow speed drill fitted with a suitable mixing paddle. To achieve the required consistency and brushability add minimum quantity of water. Mixing full units is recommended, however where required part units may be mixed providing close attention is paid to mixing ratios. Part units may be required for filling surface imperfections prior to coating the concrete. 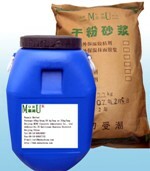 Application: Thoroughly dampen down the concrete surface with clean water prior to application. Ideal conditions are saturated surface dry (SSD). Do not apply to dry concrete. Whilst damp, apply JS Waterproofing Coating with a bristle brush or roller at the rate of 1.8 kg/m2. This is achievable in one coat on horizontal surfaces although two coats will ensure even coverage and remove pin holing. On vertical or overhead surfaces, two coats are required. Where more than one coat is required, the previous coat should be allowed to dry prior to subsequent applications. imperfections prior to coating the concrete. Spray application may be suitable for larger areas; airless spray should be used with 3-4 mm nozzle sizes at 6-8 bar pressure. Trials should be conducted to finalize the best method for application. Ensure continuous supply of mixed product when adopting this method. Equipment should be thoroughly cleaned immediately after use with water. Hardened coating may only be removed mechanically. At up stands and across joints, it is recommended that a geotextile mesh be imbedded in the coating. This will increase the physical properties and will aid distribution of localized stresses. The mesh should be applied as a sandwich between the first and second coats of JS Waterproofing Coating. As JS Waterproofing Coating is moisture tolerant, it can be applied onto concrete that is only 24 hours old thereby giving immediate protection and curing. Where heavy depressions, cracks or blowholes are present, reduce the amount of gauging liquid in the mix to the desired consistency and carry out re-profiling. When used in tanking applications allow the coating to cure fully for 72 hours prior to water testing. Approximately 1.8 kg/m2 @ 1 mm thickness per coat and two coats required. JS Waterproofing Coating is supplied in 7.2 kg units as Part A & Part B and it has a minimum shelf life of 6 months provided it is stored under cover, out of direct sunlight. JS Waterproofing Coating does not fall into the hazard classifications of current regulations. However, it should not be swallowed or allowed to come into contact with skin and eyes. Suitable protective gloves and goggles should be worn. Splashes on the skin should be removed with water. In case of contact with eyes rinse immediately with plenty of water and seek medical advice. If swallowed seek medical attention immediately –do not induce vomiting.